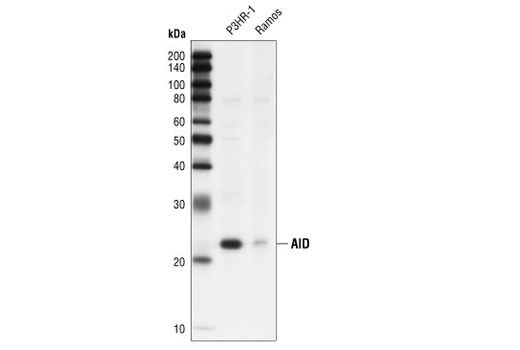 Western blot analysis of extracts from P3HR-1 and Ramos cells using AID (L7E7) Mouse mAb. Western blot analysis of immunoprecipitates from HeLa cell extracts overexpressing myc-tagged AID. Expression of myc-AID was confirmed (lane 1). 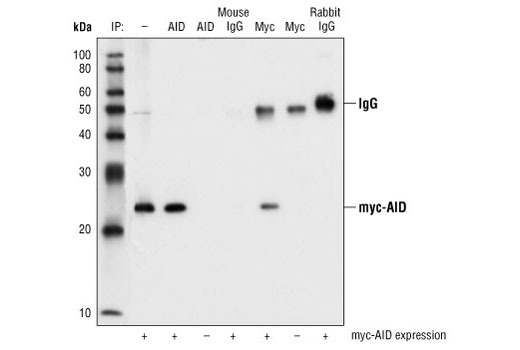 Immunoprecipitations using cell lysates with or without expression of myc-AID were performed, using AID (L7E7) Mouse mAb #4975, Myc-Tag Antibody #2272, mouse IgG or rabbit IgG. Immunoblot was performed using Myc-Tag Antibody #2272. AID (L7E7) Mouse mAb detects endogenous levels of AID protein. Monoclonal antibody is produced by immunizing animals with a synthetic peptide corresponding to residues of human AID.